Vada's Blog Stamp Inks and Paper : Gingersnap Challenge #85 is. Coffee, Tea, Cocoa “Warm and Toasty Drinks”. The Paper Company (Tea cup and Tea Bag). My card is a little larger, size 9 x 4 and will fit in a business size envelope. Beautiful ...looks very refreshing! Just like green tea is! 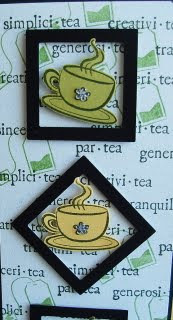 I love the framed coffee cups. Cute card. Love the framing around the hot drinks! Fabulous card, Vada! Just found out that I have to change browsers from Chrome to Firefox to be able to leave a comment! Strange! Earlier today, I realized I couldn't use a link on the PWA website with Chrome. LOVE, LOVE, LOVE your hot drinks card! Delightful! Love the color combo. This is so fun! Love the inchies.